The journey to world-class maintenance described in the previous installments of this series involves a series of actions, each accompanied by an evaluation to confirm progress and verify achievement. A review of these steps lends perspective to the actions that were taken, why they were necessary and how they could contribute to achieving world-class maintenance status. Improvement needs–The first step explains the use of evaluations to determine the initial “as is” condition of maintenance, identify, and prioritize improvement needs and create an improvement plan. Environment–The second step explains how to gain the cooperation and support for maintenance to create a positive working environment. Evaluation results from step 1 guide this effort. Program–The third step illustrates how to develop, document, test, implement, and utilize a quality maintenance program with capability to deliver reliable equipment and enable workforce productivity. Again step 1 results guide this effort. Information–The fourth step provides guidelines for the selection, implementation and utilization of an information system to manage the maintenance program. Step 3, program development, provides details of information needed and the step 1 evaluation results pinpoint specific improvement needs. Organization–The fifth step establishes the attributes of a maintenance organization that can execute the maintenance program efficiently. All of the previous steps contribute to organization selection. The sixth and final step in this process comprises evaluation techniques for the long term and incorporation of evaluations into the mine’s continuous improvement efforts. These techniques are explained and illustrated in the following text. Specific deficiencies causing excess costs are identified by examining their relationships to the maintenance program, the use of information and the organization. Each deficiency is assessed to determine what improvements are required to meet cost reduction objectives. Improvement needs are prioritized to create an improvement plan. As the plan is carried out, progress and achievements are determined with continuing evaluations until cost reduction objectives are met. 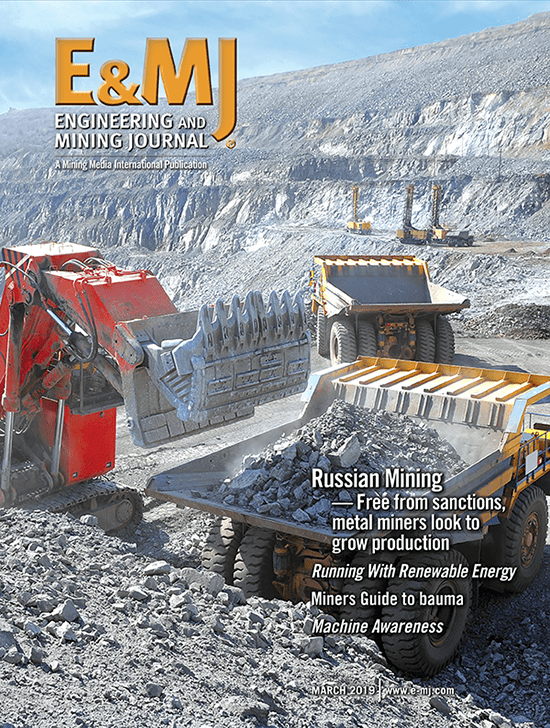 Evaluation technique–Evaluation techniques should be considered based on the mine situation. Some operations may require an evaluation in which every detail must be scrutinized. Other operations, having established the essential pattern of evaluations, may simply check progress by measuring only a few critical areas. There are three techniques that can be used to evaluate maintenance performance: a physical audit; questionnaire; and physical audit with questionnaire. Physical audit–A physical audit is usually conducted by a team. The team can be made up of consultants or company personnel (or both). They examine the maintenance organization and its program, as well as activities that affect maintenance (such as the quality of material support). 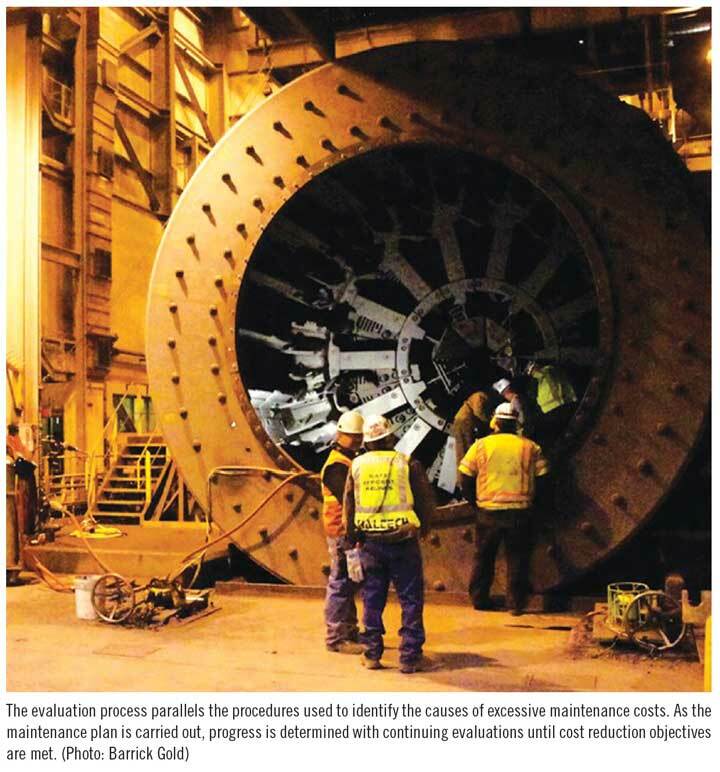 The physical audit examines the total maintenance activity first hand, by observing work, examining key activities, reviewing costs, and even measuring productivity. It relies on interviews, direct observation of activities and examination of procedures, records, and costs. When done properly, the physical audit produces effective, objective and reliable information on the status of maintenance. The physical audit by itself should be used when personnel could not be frank, objective and constructive in completing a questionnaire. But, the physical audit is also useful when plant personnel want an opportunity to discuss issues and offer suggestions. However, a physical audit lasting several weeks can be disruptive because of the time required to help explain procedures or participate in interviews. Therefore, it must be well-organized in advance. Questionnaire–A questionnaire gives a cross-section of randomly selected personnel an opportunity to compare maintenance performance against specific standards. This cross-section might include personnel from management, staff departments (such as purchasing), operations and maintenance. Although a questionnaire is subjective, the results are, nevertheless, an expression of the views of plant personnel. Therefore, participants will have committed themselves to identifying improvements they see as necessary. To most of them, this constitutes potential support for the improvement effort that follows. When administering a questionnaire, be careful to ensure that personnel are qualified to respond. For example, participants outside of maintenance should respond only to those standards on which they have personal knowledge. The evaluation must be administered so that questions on evaluation points can be answered completely. When carried out properly, the questionnaire can produce reliable results quickly while minimizing disruption to the operation. The questionnaire has the advantage of being administered often so that progress against the previous results can be measured. For example, one plant was able to establish areas in which improvement was still needed while setting aside areas in which good progress had been demonstrated by previous evaluations. The questionnaire is the best choice when a quick, non-disruptive evaluation can serve as a reasonable guide in developing an improvement plan. It must be carefully crafted so that it embraces all of the elements of the maintenance program, like planning, as well as activities that affect the program, such as purchasing. Participants should have personal knowledge of maintenance performance for the standards against which they are comparing maintenance. There should be selectivity in who responds to what. For example, the accounting manager could evaluate the quality of labor data reported but, could not evaluate work quality. Questionnaires are rarely of value if they are not administered in a controlled environment. Typically, if distributed for completion at the respondents’ leisure, expect poor results because there are too many opportunities for misunderstanding when questions about the standards cannot be answered quickly or interpreted by the administrator. Questionnaires administered in a controlled environment, where participants can be oriented and their questions answered, are always best. Physical audit with questionnaire–The combination of a physical audit and a questionnaire provides the most complete coverage. The techniques work together. The questionnaire, for example, provides confirmation of physical audit findings. This technique is helpful if it combines the objectivity of the outsider in the physical audit with insight of mine personnel using the questionnaire. The questionnaire is useful in educating personnel to gain their early potential commitment to improvement. As the insiders, their help is needed. Without it, little will happen. This combined technique is the best way of preparing for the improvement effort that must follow. For purposes of initiating the journey to world-class maintenance as quickly as possible, an evaluation using a questionnaire is recommended. While the plant may choose any method of conducting an evaluation, some methods may require funding as in the use of consultants. If this procedure is chosen, there may be considerable delay in requesting and obtaining funds to pay for the consulting evaluation. ance without further delay. However, it is important that if standards are considered, a sufficient cross-section of personnel from the mine must be involved. Participants should include not only those key personnel who are in maintenance but also personnel from operations, all staff departments and mine management. When all of the results are brought together there will be a reasonably accurate picture of improvement needs and their priorities. But more importantly, exposure to the self-evaluation process will cause the participants to realize that they are not perfect in their performance and as they rate themselves against the standards they will also be making a preliminary commitment to do something about it. Identify participants—Every department and management should participate in the evaluation because all impact the success of maintenance. The number of personnel from each department will vary with maintenance having the largest percentage. The maintenance group should represent a vertical slice of their organization: the superintendent, several foremen, a planner and several craftsmen. Operations would have: the operations manager, several supervisors, the production scheduler and several operators. The mine or plant manager should participate along with the managers of principal departments such as warehousing, purchasing and accounting. Using standards—Standards establish the best, most effective way that an activity should be carried out. Participants compare their personal knowledge of the organization’s performance against the standards. The standards cover key activities like: preventive maintenance, planning or organization. The accompanying sidebar illustrates the standards that would apply to preventive maintenance. 1 – Never done or done poorly. 2 – Rarely done or much improvement needed. 3 – Occasionally done but trying to improve. 4 – Done most of the time and continually improving. 5 – Done all of the time, carried out professionally. 0 – Activity not applicable. Evaluation results—Once the ratings of all participants are processed and compiled, each individual standard can be studied to determine what improvements are necessary or whether performance is satisfactorily (See Figure 1). pants to ask questions. Smaller groups are workable if all participants are not available. Avoid allowing participants to complete the questionnaire at home at their leisure. Ideally, evaluation results are presented in a logical order starting with a Summary Report (See Figure 2). 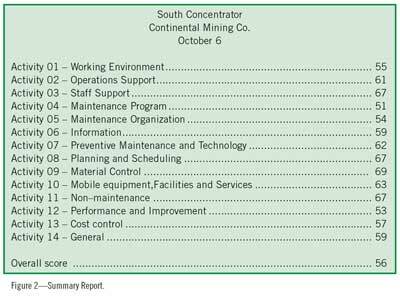 Activity 04 in the Summary Report (Maintenance Program) has the lowest rating when compared with the overall score. Learn why by looking at the ratings of all individual standards that make up Activity 04. Standard 15 is typical of rating detail. Evaluation results identify activities in need of improvement by priority when compared with the overall score. Activity 04–Maintenance Program, for example, is given top improvement priority among all activities. Examination of all ratings for individual standards (actions) that comprise Activity 04 would establish improvement priorities, lowest to highest, when compared against the Activity score (51). These actions become the preliminary improvement plan. Information such as this enables an organization to quickly identify problem activities and specific troubles within the activity so that an improvement plan can be developed, priorities set and improvement actions launched without delay. Carry out the improvement plan by establishing an advisory group; using the preliminary improvement plan as a guide, solicit explanations and constructive comments to help interpret evaluation results possibly explaining underlying problems or modifying some priorities. Launch the improvement plan by setting periodic milestones and repeat evaluations focused on specific actions within activities like the maintenance program. In summary, greater assurance of profitability is the sum total of all world-class maintenance goals—but the continuing application of evaluations is the best guarantee that the hard-earned benefits of world-class achievement can be sustained. Paul D. Tomlingson (pdtmtc@msn.com) is a Denver-based maintenance management consultant. These articles are based on his book: Maintenance in Transition – The Journey to World-class Maintenance. This 396-page book, comprising 32 chapters and five appendices, is available from the author. The Preventive Maintenance (PM) program should successfully avoid premature failures through timely inspection, condition-monitoring and testing. It should help extend equipment life with lubrication, cleaning, adjustment and minor component replacements like belts and filters. By avoiding premature failures, there will be fewer emergency repairs and more work can be planned because equipment deficiencies will be found long before failure, creating opportunities to plan the work. 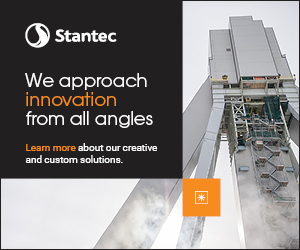 Because the resulting planned work is jointly scheduled with operations, it will be performed more productively and carefully by maintenance personnel, whose work will be of higher quality. Higher quality work increases the time before the work must be repeated. As a result, components will have a longer operating life and additional cost savings will be realized by reducing the rate of material consumption. There is a well-defined overall PM program that has been explained to all maintenance and operating personnel. Management understands and strongly supports PM. They require a report of PM compliance and have made operations accountable when equipment is not made available for scheduled PM services. The PM program is “detection-oriented” to uncover equipment deficiencies well in advance of potential equipment failures. The PM program emphasizes the careful inspection and testing of safety equipment and conditions to result in minimum safety hazards and injuries. The PM program emphasizes preserving the functions of equipment and avoiding the consequences of failure. The PM program has successfully reduced the amount and severity of emergency repairs. The PM program has resulted in a significant increase in the amount of work this is planned. The manpower, by craft, required for the conduct of each PM service, and for the entire program has been determined and confirmed. Completion of PM services is verified including a report of PM schedule compliance to management. When new equipment is added or existing equipment modified, changes are made to the PM program promptly. The overall PM program is reviewed periodically to determine its adequacy. PM services carried out by maintenance personnel and, as required, by equipment operators are performed with care and diligence. Supervisors and team leaders follow up promptly to ensure that PM services are done on time. Operating personnel cooperate fully with the PM program especially in making equipment available for the approved schedule. Where appropriate, equipment operators perform PM-related tasks completely, efficiently and correctly. Condition-monitoring, using predictive techniques such as vibration analysis are properly integrated into the PM program and skillfully used. 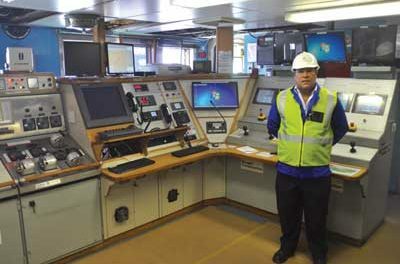 Where specialized condition-monitoring devices, like onboard computers, are in use, maintenance personnel can effectively download data, analyze it and utilize the resulting information effectively. Each PM service has a standardized checklist describing exactly how the service is to be carried out. PM services are identified by an appropriate work order element to help schedule and control the work. Extensive repairs are not carried out until the PM service is completed and the nature of needed repairs established. PM services are scheduled at the correct intervals. PM services for fixed equipment are linked together in routes to avoid unnecessary travel in plants. Or, PM services for mobile equipment are scheduled to avoid unnecessary interruption of operations and the best use of maintenance resources. Operators and craftsmen recognize the importance of PM and collaborate to ensure the program is successful. The overall PM program has contributed to better overall maintenance performance as a result of, for example, fewer emergencies, more planning, less downtime and cost reduction.